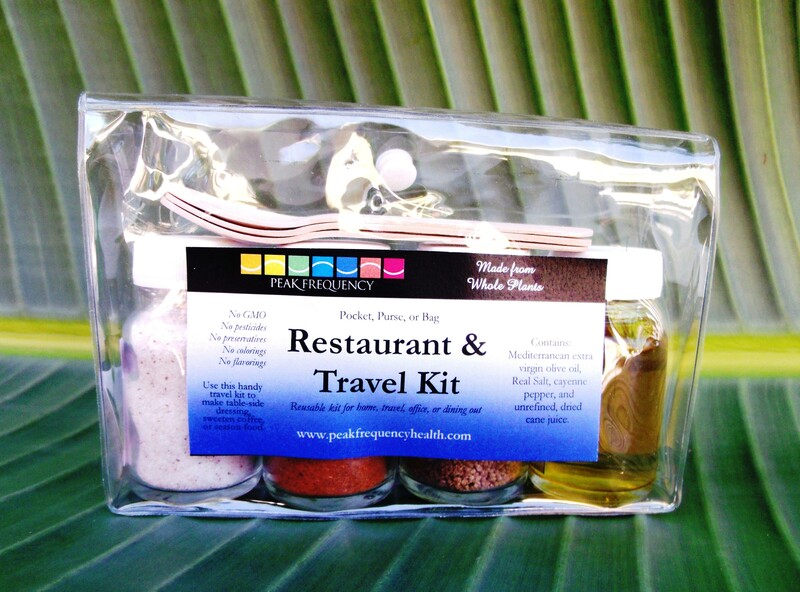 For those on the go this handy Peak Frequency Restaurant & Travel Kit is made for dining out and light traveling. Its re-closable, clear vinyl container fits in pocket, purse, or bag (6x4x2 inches), holds 4 refillable 2 oz. glass bottles, and 3 reusable 1/4 tsp. birch wood spoons. Contains: 1. Extra Virgin, Cold Pressed, Mediterranean Olive oil 2. Sucanat organic evaporated cane sugar 3. Real Salt -ancient seabed electrolyte salt and 4. Cayenne pepper, low heat - to replace black pepper.